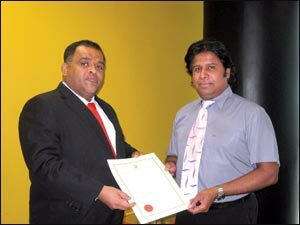 BOI, Chairman/Director General Dhammika Perera, presenting the BOI Certificate of Registration to Tilko Managing Director Thavarajah Thilagaraj. Director of the company Thavarajah Thilagaraj. The project carried out under the Accelerated Development Program for the Northern Province is for an initial investment of Rs. 80 million. The company will establish a modern hotel offering a comfortable stay for guests. The hotel will consist of 33 guest rooms and two cottages to accommodate group tourists. The hotel will offer facilities such as restaurant, gymnasium, and conference hall. The hotel is established in a 340 perch land with an overview of the lagoon and the beach. Thilagaraj said that the area lacked hotels offering proper facilities to tourists. Thilagaraj described the hotel as a luxury hotel targeting the business community, tourists and expatriates. The company has already commenced construction of the hotel and expects to commence commercial operations in February 2010. "There is so much investment potential in the area and investor confidence must further be enhanced" said Thilagaraj. Managing Director of the Company Thavarajah Thilagaraj signed the agreement on behalf of Tilko Jaffna City Hotels (Private) Limited.